A 100W MOSFET power amplifier circuit based on IRFP240 and IRFP9240 MOSFETs is shown here. The amplifier operates from a +45/-45 V DC dual supply and can deliver 100 watt rms into an 8 ohm speaker and 160 watt rms into a 4 ohm speaker. 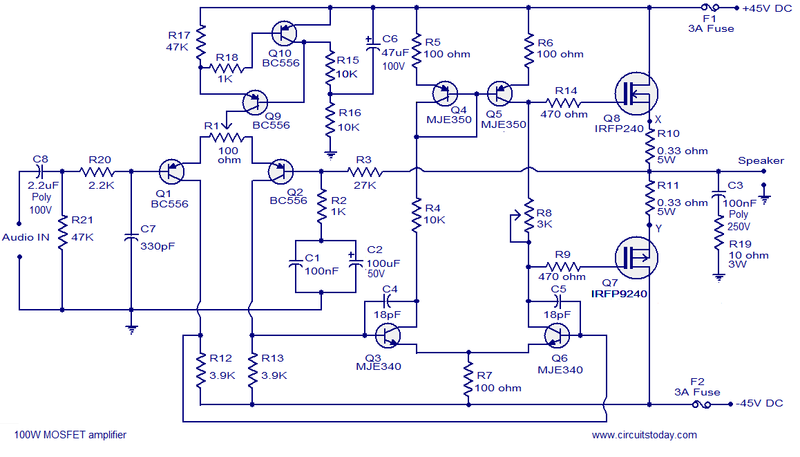 This Hi-Fi amplifier circuit is suitable for a lot applications like general purpose amplifier, guitar amplifier, keyboard amplifier. The amplifier can be also used as a sub woofer amplifier but a subwoofer filter stage has to be added before the input stage. The amplifier has a low distortion of 0.1%, a damping factor greater than 200, input sensitivity of 1.2V and the bandwidth is from 4Hz to 4 KHz. Capacitor C8 is the input DC decoupling capacitor which blocks DC voltage if any from the input source. IF unblocked, this DC voltage will alter the bias setting s of the succeeding stages. Resistor R20 limits the input current to Q1 C7 bypasses any high frequency noise from the input. Transistor Q1 and Q2 forms the input differential pair and the constant current source circuit built around Q9 and Q10 sources 1mA. Preset R1 is used for adjusting the voltage at the output of the amplifier. Resistors R3 and R2 sets the gain of the amplifier. The second differential stage is formed by transistors Q3 and Q6 while transistors Q4 and Q5 forms a current mirror which makes the second differential pair to drain an identical current. This is done in order to improve linearity and gain. Power amplification stage based on Q7 and Q8 which operates in the class AB mode. Preset R8 can be used for adjusting the quiescent current of the amplifier. The network comprising of capacitor C3 and resistor R19 improves high frequency stability and prevents the chance of oscillation. F1 and F2 are safety fuses. Set R1 at midpoint before powering up and then adjust it slowly in order to get a minimum voltage (less than 50mV0 at the output. Next step is setting up the quiescent current and keep the preset R8 in minimum resistance and connect a multimeter across points marked X & Y in the circuit diagram. Now adjust R8 so that the multimeter reads 16.5mV which corresponds to 50mA quiescent current. Fit Q7 and Q8 to a 2Â°C/W heat sink. Both Q7 and Q8 must be isolated from the heat sink using mica sheets. Heat sink mounting kits for almost all power transistors/ MOSFETs of almost all package styles are readily available in the market. Power supply for the 100W MOSFET power amplifier. A basic dual power supply is used for the amplifier circuit. If 6A ampere bridge is not available, then make one using four 6A6 diodes.C10 and C11 are high frequency bypass capacitors. Filter capacitors C8 and C9 must be at least 10000uF, higher the value lesser the ripple. Optional 3A fuses can be added to the +45 and -45 lines. Transformer T1 can be a 230V primary, 35-0-35 V secondary, 300VA step down transformer. This amplifier will burn.. Vertical MOSFETs need temperature compensation of the bias !!!!! i have a 24-0-24 5Amp. transformer is this suitable for this amplifier? sir we build this circuit for our project and everything’s fine it is DISTORTED what shuold we do ? please check the input. it’s possible the output signal distorted if input signal is too high. so reduce the input and check. still problem is exist then check the power supply. predicting output volume is less as compare to 30 watt apmlifier. everything is fine and correct. is this problem occurs because of multiturn trimmer? always. because whenever I switch on the circuit the quiescent current is different than I adjusted prior. what is wrong? and what to do? is it possible if I add one or two more pair of IRFP240 and 9240?? if I add two more pair of same MOSFET i.e total three pair of MOSFET then what should be the value of source resistor and gate resistor of each pair ??? and what will be the output power for three pairs of MOSFET if I m using power supply of +/-50 volts 3 amp. ??? Try this 300W Hi-Fi mosfet Amplifier http://adf.ly/vNFeo. The sound is superb. http://adf.ly/vLIxB link of 100W subwoofer amplifier PCB layout comes from Sir Seetheraman install Pad to Pad software to open PCB file. Thank you sir for the PCB layout. GOD BLESS. PADS says “Job not compatible with current version of program” Could you make a utiliboard file or one I can open with my version of PADS? please provide me a pcb layout of 100 watt MOSFET audio amplifier. can I use 2 circuits of this amplifier on single power supply as shown in above post i.e -45/45 volt 3 amp.?? in which I used the transformer of 35-0-35 volt 3amp. If no, then what should I change in power supply ??? If I want to use more than two circuits of this amplifier on single power supply then what to do with transformer and power supply circuit according to no. of circuits??? For stereo you have to double the current of transformer. my question was different …. can I use 2 circuits of this amplifier on single power supply as shown in above post i.e -45/45 volt 3 amplifier in which I used the transformer of 35-0-35 volt 3amp. ???? sir what is the cause of HIZZZ….. sound in the amplifier and how to eliminate this? What is the purpose of the resistors R1 and R8 being variable? Also what use capacitors C1 and C2 in parallel? Why not use a single capacitor? R1 to make zero current flow thrbough speaker. R8 to adjust no signal current adjustment of 50mA. C1 is used to take care of HF decoupling, as C2 is wound capacitor with inductive componunt and for LF decoupling. Pretty useless. If you try to build, it will not work, as they have not included a lot, what you see is only the tip of the ice-burg. what they cant explain actually makes a circuit work. I am planning to make a 2.1 sound system with your circuit. The spec is given below, also I have some doubts regarding the project. It will be great if I get your valuable suggetions. 1. do I need to use a preamp in this circuit ? because I am splitting the input into two different amplifiers (sub and left right). I think preamp will just only increase the voltage level of the input signal, but when we split a signal into two actually the current is divided into two. Will the preamp be helpful in current gain? 2. I will use 20-200 hz lowpass filter before the subwoofer amplifier, do it act as a preamp ? 3. In common I have seen bass and treable control knobs in amplifiers but I want to use low, mid and high controls, is it okay? if yes please suggest me some links to get low, mid and high control board circuits. 4. I am planning to fix all these circuits in a single casing so can i use a single transformer to the entire system, if yes please specify the voltage and amps. 5. i have heared that the amplifier should be 50% more powerfull than the drivers to get good performance at max volume levels , so I decided to upgrade your circuit from 100 watt to 150 watt, so what kind of changes should I do with the given circuit ? 6. I want to add a short circuit or overload protection fuse in this system, suggest some links to get some idea about this. 7. One woofer, midrange and tweeter will be connected parallely to the one channel of stero amplifier, so I think two 8 ohms drivers can make 4 ohms load. I didn’t considered the tweeters impedence. Do the tweeter have impedence ? or is it significant ? 8. Im also planing to do a LED spectrum analyser and digital volume controls with remote. These features will be added later. If u have ideas about these please share. and again I saw the voltage across the x and y point it was varying and never stay stable. hence I change the R8 slowly and change in R8 caused to overheating of MOSFET and again my MOSFET is dead. when I checked the MOSFET by separate it from circuit after it blew up the gate and drain pin of IRFP240 and gate and source pin or IRFP9240 is showing shorted on multimeter. what can be the reason behind damage of MOSFET. zero signal output of my circuit is 2 to 4 mV is this okay??? and what to do for unstable quiescent current. so the voltage across x and y point should be the 60 to 65 mV. this is the third time my MOSFET dead. when I was testing the circuit second time I connected 4 ohm speaker and input was from mobile phone. output was totally distorted. I thing it was because of one MOSFET is damage from both and one is on. but gain was less than 8 watt. because I was connected 8 watt speaker and I thought speaker should blow up but it didn’t happen rather the volume was so less than the volume in 10 watt amplifier. what can be the reason behind of less gain. but the problem is both MOSFET heating too much within 2 minute averaged so that the soldering flux at pin of MOSFET also melts. is the reason behind of heating MOSFET is few extra voltage???? what is the reason behind of this?? anyone can suggest? what to do for this huge heat??? how to solve this??? seetharaman sir please please please reply…..
what to do pleas help me…. The amp works fine. Of course R17 must be 470 ohm. With 47 Kohm you get no sound, Q1 and Q2 remains closed. What happened to R6, R7, R8, R9, R10, R11 and R14 are they burnt. Which are the resistances burnt. This give a clue about your problem. Hope you have not exceeded + / – 45 volts DC and used fuse also. Hope you have kept R1 at center and R8 at minimum value before switching on your amplifier. The resistors seems to be fine. I disconnected the circuit from mains quicker than the fuses. Could the root of this problem be an overheated transistor when soldering? I think that i might did that with some of the mjeÂ´s as i soldered them of from another pcb. up to 30 seconds with 275 to 300 deg C should not matter. might have been defective ones. to quick check do not connect MOSFETS with just other transistors switch on check the voltages it should give a fair idea about the circuit healthiness. Once things are fine set current adjusting pot to minimum value switch on with new MOSFETS and with a dummy load of 25 ohms without speaker.If things are ok set the current as recommended, and connect 8 ohms speaker and try. As I powered up, Q5, Q6, and Q7 blew up. Something must be terribly wrong with my circuit. Any suggestions on where the error could be located? In the centre of Q4 & Q5 base to collector is that jumper ? It is a temperature compensated constant current mirror. The current through Q5 and Q6 will be identical. You cannot use 25 volt transformer. you have to use 25 – 0 – 25 volt 5 Amp transformer with bridge rectifier and filter capacitors to get plus and minus 35 volt power supply for the amplifier. With this power supply and 4 ohms load (speaker) you will get 100 watts RMS output power. If i connect 25v 5amp ac and 10inch 4ohm subwoofer, what power will actually get when it use as a subwoofr amp? Hi BC556 VCeo is 80 volt but 557 is only 50volts, hence it will be oprating at the brim and may get damaged, hence it is preferable to use BC556 only. Can I use 20pf in place of c4 n c5?? Can i attach the mosfets from two circuits to a 1 C/W heatsink? If you are using 2 similar amplifiers yes with proper insulating kits you can use provided the sink is sufficiently big to take care of the generated heat. If heat sink temperature is used for thermal compensation it cannot be used. It is a better practice to use separate heat sink for each different application. Finaly the quiescent current MUST BE 50mA? Pls seed! Hi you are correct it should be 33mV. what is written should be across one source resistance only. If I power up six of these with the same power supply, what value should each rectifier diode have? Wich tracks carries the largest currents? Tracks connected to Q7 Q8 source and drain and loud speaker. Please, could I add another 3 pairs of MOSFET at the output stage thereby making it a 400 watts?? Please, could I add another 3 pairs of MOSFET at the output stage thereby making it a 400watts. Hi, I have one question. Does output of this circuit is short circuit protected? not avail the transistor mje340/350. bd139/140 not suitable. I’ve one doubt how to ctrl the vol of the amp? Can you please provide the PCP layout..
First of all i want to tell you that its a VERY LOUD amplifier even with dual 27V transformer,i will try it with 40v when i buy the new transformers, i have only one question, what kind of pot is the ideal to adjust the volume? I use a 100k pot but when i turn it off i stil have sound in my speakers, a 1M ohm pot would be good or even it will be small? Hi Theofrastos 100K logarithmic control that should take care for volume problem at lower settings, do not use Lin controls. sir,can i pls get the circuit theory analysis of the 100watt mosfet amplifier. Hi Niklas in the place of R8 put a link. Reduce the fuse rating to 500mA. If every thing is oK it should stay alright if the fuse blows indicates something wrong in the wiring. Please check and correct and proceed as above. If it is ok replace link with say 2k2 pot and set the current through the fuse for 50 to 60 mA. Hi Baz you are correct. Hi Ifte without feeding any input to the amplifier (say volume control fully closed no sound from speakers)connect a multimeter across points marked X & Y in the circuit diagram and adjust R8 so that the multimeter reads 16.5mV which corresponds to 50mA quiescent current. 1. what is zero signal output voltage of the amplifier? and how can i measure it? Hi Harry as per following link it is a good performer. tell me anyone using this amplifier is this working? thanx Seetharaman, but this is a 400W mosfet amplifier layout how can i use it for 100 W mosfet amplifier. Hi Harry can be used. Can I get the PCB for the same or atleast PCB Layout…pls reply..
i build this amplifier but when i switch on the power supply the IRFP9240 heats up and gets burn. so what should i do. i want ur help guyz……. someone have the PCB layout for this amplifier? This escheme was not designed for this author. This amplifier work fine, but in the scheme displayed here, have some issues. The â€œpotsâ€ (R8 and R1 must be mult turn), the value of R17 is not a 47K. The R17 must set a current aprox of 1mA, so, we need a 330r to 470r. R*I=U, R=?, I=0,001A U=0.650v,(equal a VBE voltage). Do the calc, and see for yourself. Be carefully for use others MOSFET. The bandwidth is 3,6Hz to 39.4KHz. Donâ€™t exceed 55V dc for each rail. All that you need is 40+40AC 225VA trafo for each channel@160Wrms/4ohms. Good Luck. This escheme was not designed for this author. This amplifier work fine, but in the scheme displayed here, have some issues. The “pots” (R8 and R1 must be mult turn), the value of R17 is not a 47K. The R17 must set a current aprox of 1mA, so, we need a 330r to 470r. R*I=U, R=?, I=0,001A U=0.650v,(equal a VBE voltage). Do the calc, and see for yourself. Be carefully for use others MOSFET. The bandwidth is 3,6Hz to 39.4KHz. Don’t exceed 55V dc for each rail. All that you need is 40+40AC 225VA trafo for each channel@160Wrms/4ohms. Good Luck. Hi Joel this amplifier’s bandwidth is 4Hz to 40KHz, which is quite fine for audio use. what is written is wrong a zero is missing in the upper limit. Hi Gamerandds most economical IRFP540 / 9540 pair also can be used. It can work with 4 ohms speaker delivering around 200watts. below this impedance it is risky to operate the amplifier it may blow the FETs. WILL THIS RUN ON 2 OHMS STABLE? Will the Irfp250 work instead of the 240 in this circuit? Hi Mike you can try is the standing current is not raising to required level with R8, you may have to raise R8 to 4.7k pot. otherwise it should work. I will make a pbc for this circuit if u want it just ask, but has anyone considered using Irfp250 for this circuit instead? I dont wanna just buy 20 if them and they don’t work. ??? Selanco add another pair of mosfets with it’s own resistors, I’m planning on adding 4 more to get around 500 watts rms. Remember that in 4 ohms one pair can Play up to 160 watts!! Does bass preamp will work like a filter? Will this circuit work for a bass amp/combo? I think that it will do the job, but I want to be sure. Also has anyone saw or made/could make, a pcb project for this schematic? This amp will work, but you have to add a filter circuit at the input. 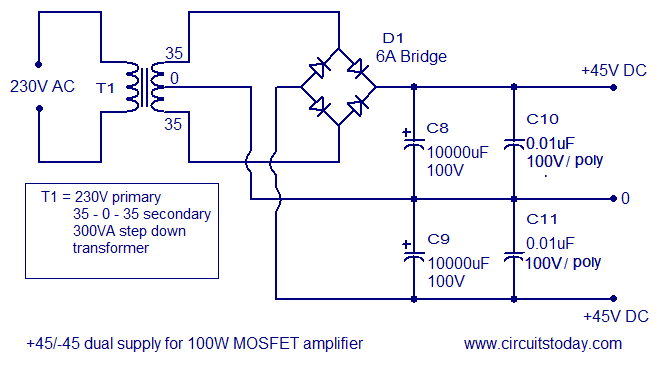 i need 200watts (rms) mosfet subwoofer amplifier circuit diagram.